all mobile phones and pdas. your cooperation is appreciated. we welcome the public's participation during public comment periods. there will be opportunity for public comment at the beginning and end of the meeting as well as after every item on today's agenda. each comment is limited to three minutes. and a council will respond to your comments following the meeting if you provide your contact information. 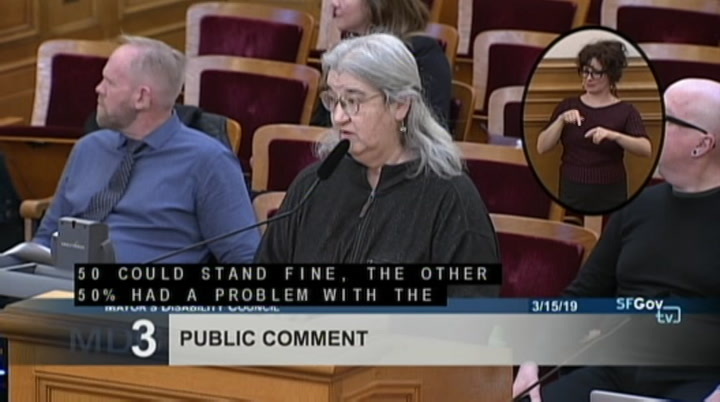 you may complete a speaker's card, available in the front of the room, approach the microphone during public comment, or call our bridge line at 1-415-554-9632.
where a staff person will handle requests to speak at the most appropriate time. 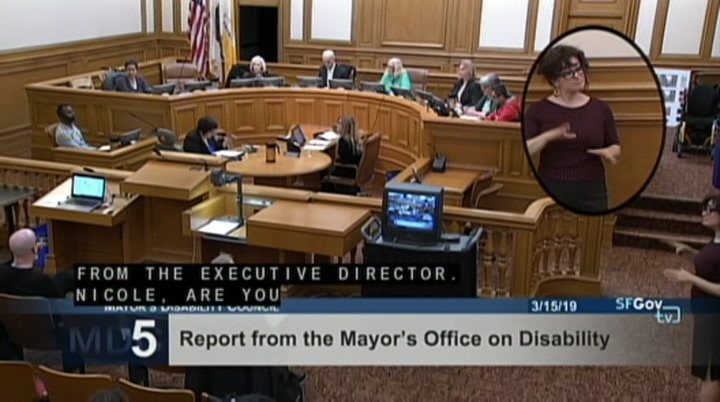 the mayor's disability council meetings are generally held on the 3rd friday of the month. 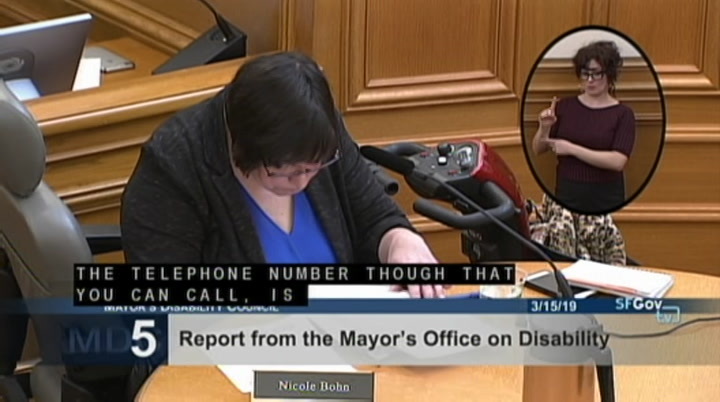 our next regular meeting will be held on friday, may 17, 2019, from 1 p.m. to 4 p.m. right here at san francisco city hall in room 400. please call the mayor's office on disability for further information or to request accommodations at 1-415-554-6789 voice, or e-mail them at mod@sfgov.org. a reminder to all of our guests today to speak slowly into the microphone. i had to learn that myself. to assist our captioners and interpreters, we thank you. -- for joining us. so what i'd like to do is ask roll call of the council members here today. >> co-chair denise senhaux? >> present. jim blacksten? present. alex madrid, here. council member sally coghlan mcdonald. present. council member orkid. >> co-chair blacksten: i believe we have a quorum. only missing one person. let's move to item number 2, action item, it's the reading of the agenda by staff. 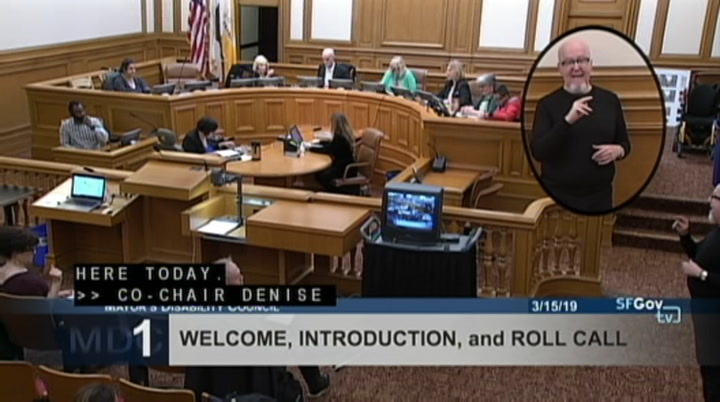 >> item 1, welcome, introduction and roll call. item 2 action item, reading and approval of the agenda. item 3, public comment. items not on today's agenda but within the jurisdiction of the mdc. we welcome the public's participation during public comment periods. there will be an opportunity for public comment at the beginning and end of the meeting as well as after every item on today's agenda. 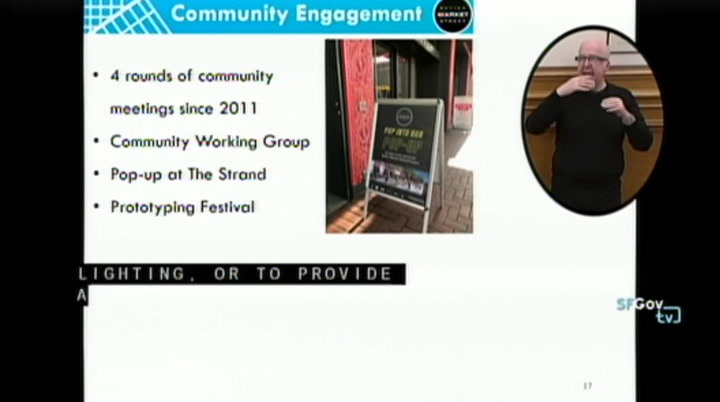 each comment is limited to three minutes and the council will respond to your comments following the meeting if you provide your contact information. you may complete a speaker's card available in the front of the room, approach the microphone during public comment or call our bridge line at 1-415-554-9632.
where a staff person will handle requests to speak at the appropriate time. item 4. information item. co-chair report. item 5. information item. 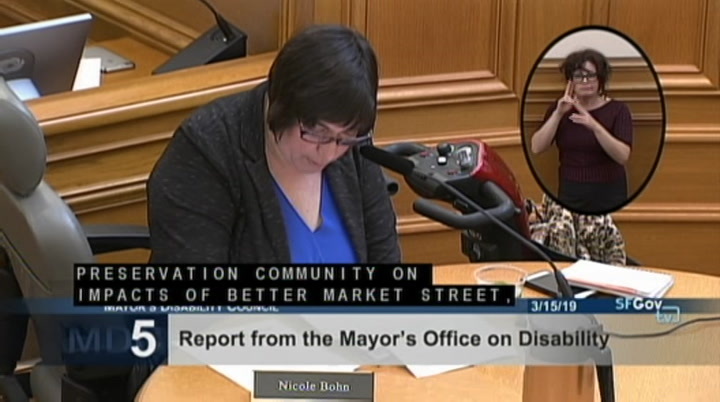 report from the mayor's office on disability. please neat that the director's report can be found on the what's new section of mod's website. item 6, information item. better market street project updates. 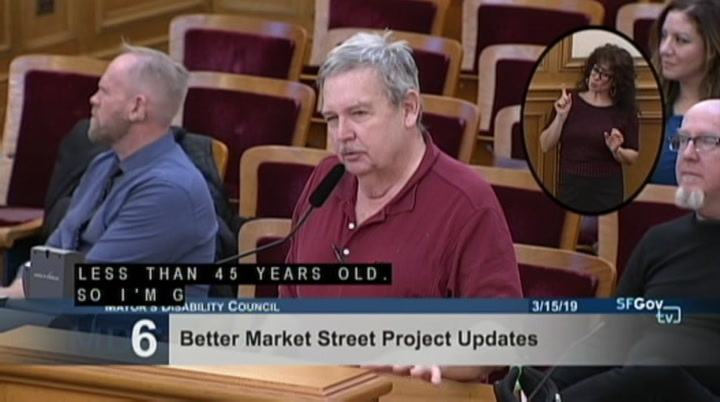 this presentation will provide an update on the better market street project including status, schedule and conceptual design. 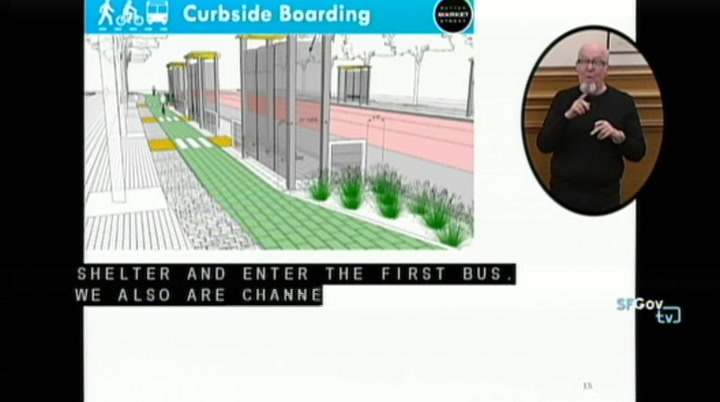 the design will include the proposed loading zones and kent and curbside boarding islands. 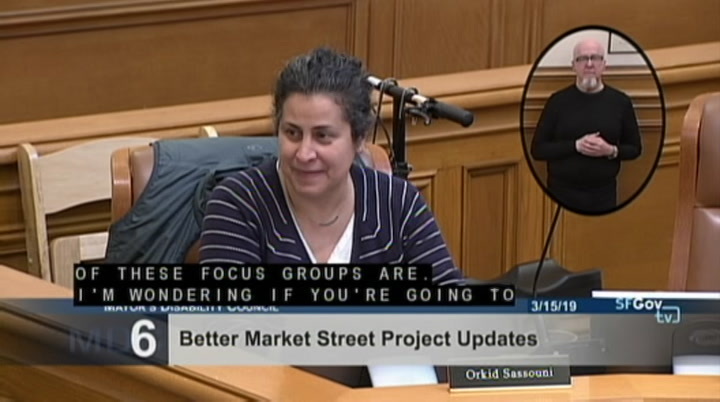 presentation by cristina calderon olea, better market street project manager, san francisco doesn't of public works. break. 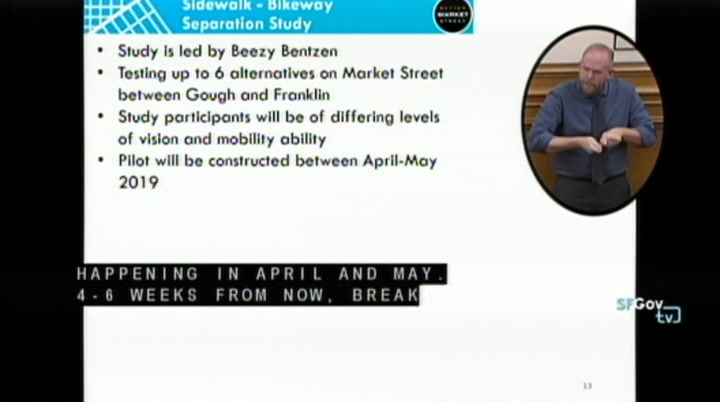 the council will take a 15-minute break. item 7, information item. announcements. item 12, adjourned. >> co-chair blacksten: thank you, heather, appreciate it very much. so let's see, now that we've done that. let's move on to number 3, which is -- do we have any speaker's card for public comment? >> yeah, we do. the first is bob. >> excuse me, is this where you wanted to speak? you'll go next. >> do we need to approve the agenda? >> yeah, we need to do a motion. 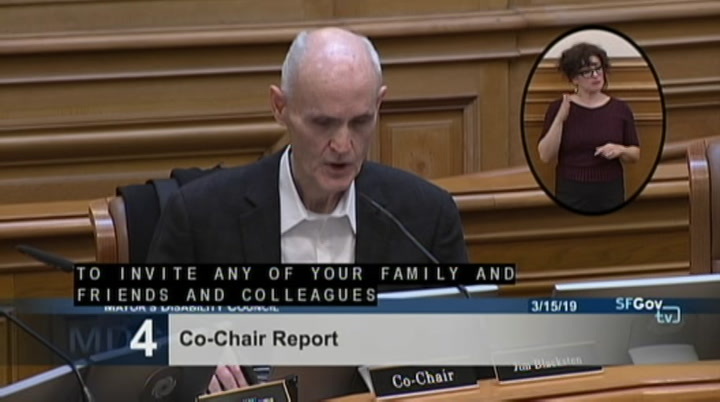 >> co-chair blacksten: i'm sorry. do i have a motion to approve the agenda? >> motion to approve. >> co-chair blacksten: do i hear a second? it's been moved and seconded. all those in favor? our feet, who have any number of variable mobility patterns that does not make us fully stable, we could slip and fall on material that is wet, though it's considered safe. i want you to keep that in mind when you start to hear about eirs. there is nothing about accessibility. and that always has to be added in by the advocates to make sure they are paid attention to. i've been a part of various rehab and building projects where the history has preempted access in such a way that the access is cumbersome, costly and seldom used. i can give you information about that. i'm done for now. start asking lots of questions about eir and accessibility whenever it comes in front of you. thank you. >> co-chair blacksten: thank you, bob. >> we have two more. meeting. 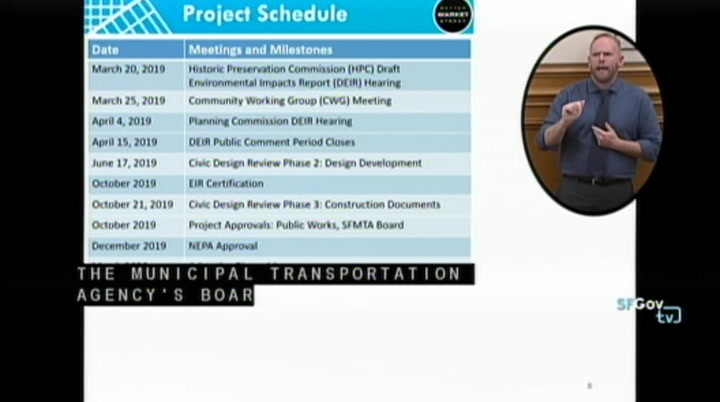 and the topic, one of the topics on there, is the procurement of the light rail vehicles and modifications that would be coming forward. that would be an opportunity to make your comments regarding the configuration, especially of the seating, and any other modifications that may be necessary. 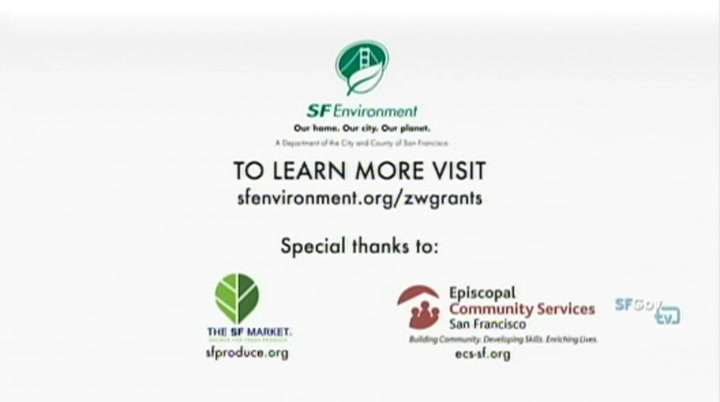 so again, that's wednesday, march 20 at 3:30 p.m. at 1 south van ness avenue on the 7th floor in the conference room. and the agenda is on the website for muni, but you have to go to the citizens committee and then go to the finance and administration to locate that agenda item. thank you very much for your time. >> co-chair blacksten: thank you. >> we have one more, robin crop. summer, my pelvis, neck and back went out. i cannot ride the new trains. i have to wait for the current train to come. i'm very concerned about what is going on because they're going to be ordering more trains. i then did a survey of around 100 people, muni riders, and found out it was 50-50. 50 could stand fine, the other 50% had a problem with the trains. in that 50% that had problems, there was a lot of interest for forward-backwards seat support. 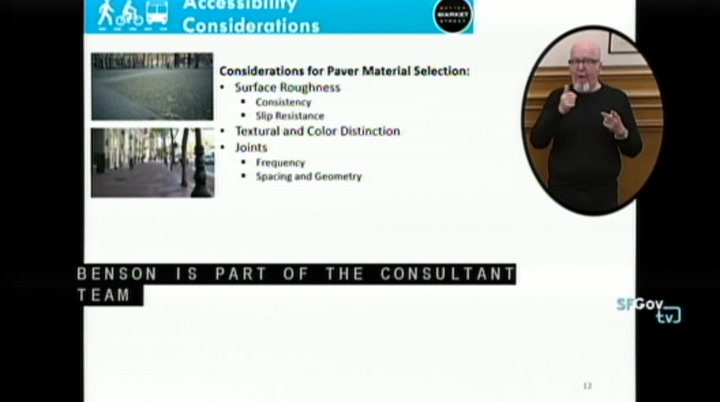 so we just saw an mta presentation last tuesday of three options for forward-backwards seats. there are only three options. one is put in four seats. one put in eight seats. i said how is anybody going to say whether they're going to get a seat if they need it? 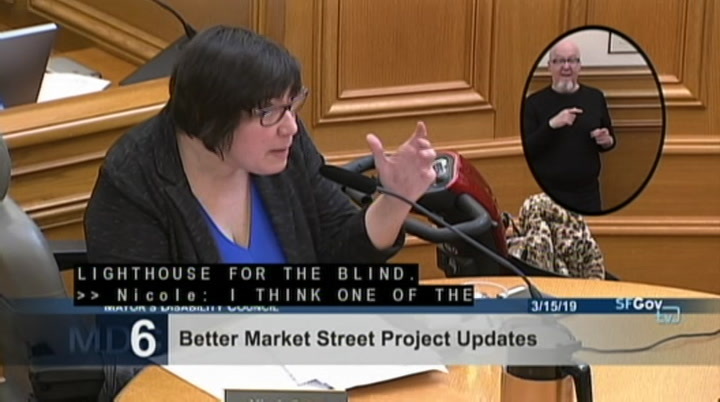 so then i got busy again and talked to muni riders about this and it's coming in 50-50.
plus one going forward. they have to give an equal weight to both parties. right now, they're just getting a rush hour group in, sitting sideways and ignoring the 50% that need and want a better ride. so it's very important. i also want to know if i can talk with anybody here afterwards because we're concerned about the situation. thank you. >> co-chair blacksten: thank you for your comment. >> talk to any of us at the break or afterwards. 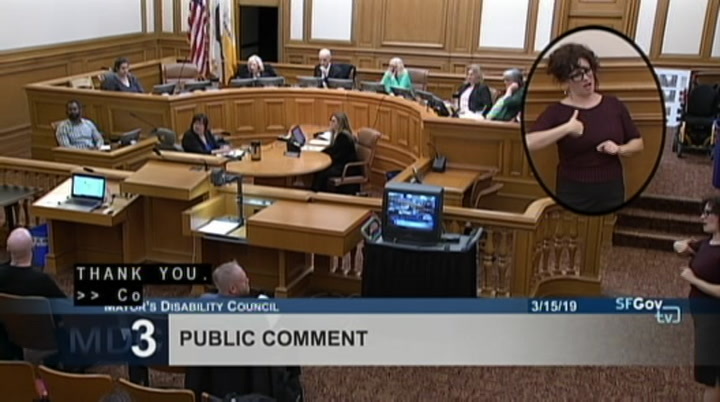 >> co-chair blacksten: please feel free to do that. it would be wonderful if you would. anymore speaker's cards? >> that's it, sorry. >> appreciate all those comments. take special note. 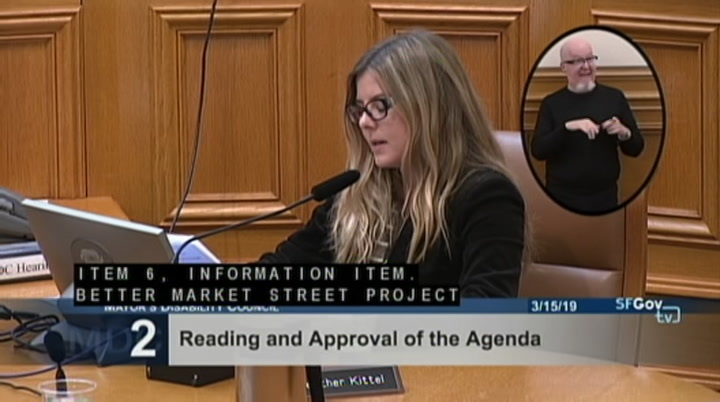 let's go forward now to item number 4, information item, which is the co-chair report. and my report is fairly brief. attention. there is something else that is of interest. i think it's called the age and disability friendly working group. it meets four times a year. and i don't think they were meeting when i first came on board two years ago. it's fairly new in san francisco. but they deal with major issues like legislation, both local, state and federal legislation that would affect seniors and people with disabilities. the new project to have a coach -- a disability cultural center. this group deals with that and will continue to do so. and seniors re-entering the workforce and much more. those are two committees i pay attention to. pertaining to folks with disabilities, please subscribe to our news feed. that is all for today. >> co-chair blacksten: thank you for that report, nicole. so i believe it is time for us to move to our item number 6 on the agenda. presentation by cristina calderon olea. 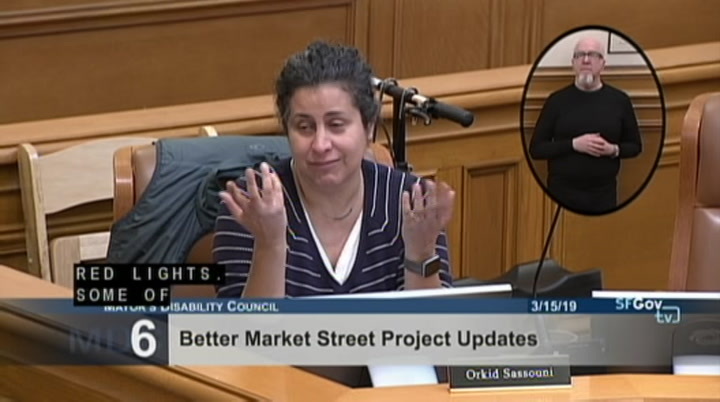 better market -- you can tell where my mind was going -- better market street project manager, san francisco department of public works, welcome. >> thank you. -- manager for san francisco public works. i'm going to pull up my presentation. 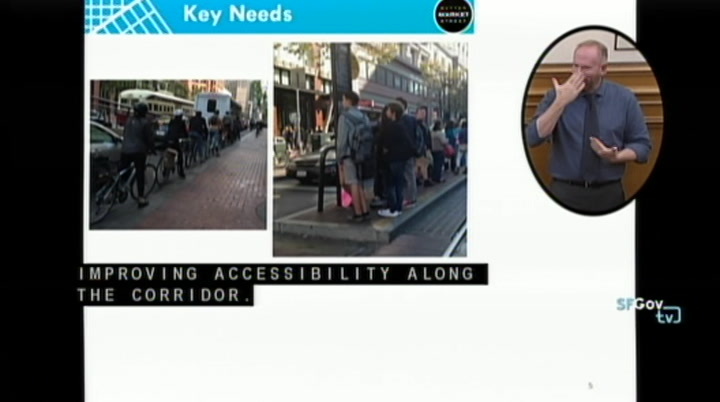 include -- have included wheelchair users. we also know that as public works, we're stewards of the public right-of-way and responsible for the safety of our residents and visitors. 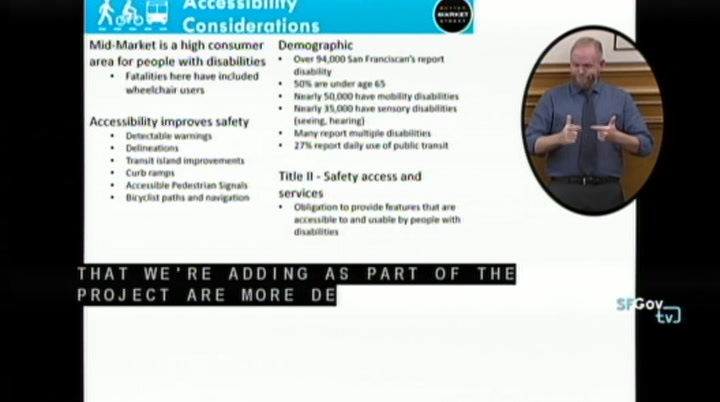 we know that improving accessibility improves safety for everyone. 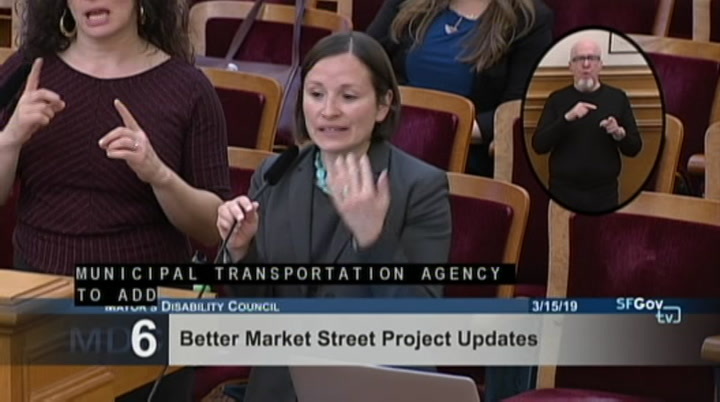 some of the tools that we're using along market street, or that we're adding as part of the project are more detectable warnings, delineations between the different modes of transportation, transit island improvements, curb ramps, pedestrian signals. pedestrian bike paths and navigation through the corridor. today i'll give you an overview of the project and design details for key elements of the project. just a few other demographic pints i wanted to bring up. over 94,000 san franciscans report a disability. useful life, the traffic signals, the streetlights, the underground utilities and sidewalks. in 2013, the project team recruited 10 individuals with various degrees of mobilities and vision disabilities to participate in the focus group. 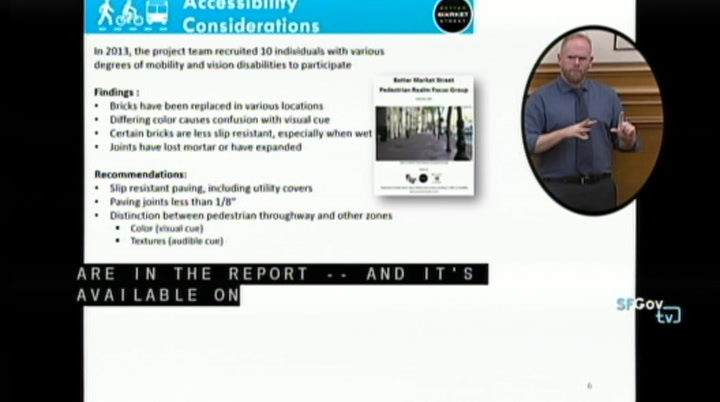 some of the key findings that are in the report -- and it's available on our website -- were that the bricks have been replaced in various locations. there is differing color, which causes confusion with the visual cue. certain bricks are less slip resist ant and some of the joints have lost mortar or expanded. the recommendations were to install slip-resistance paving. presenting the schematic design on monday, march 18. and then we'll be going back in june and in october when we have 65 and 95% design. and then other project approvals will come after final certification in the fall. so we get project approval from our own director as well as from the municipal transportation agency's board, the mta board. our goal is to advertise phase one of the project a year from now in march of 2020. and that first phase will be between 5th and 8th streets. so in the mid market section of market street. some of you may be familiar with the cycle track project that we have on market street now between gough and franklin on the south side. this raised bikeway was a pilot back in 2015.
drive in the curb lane. 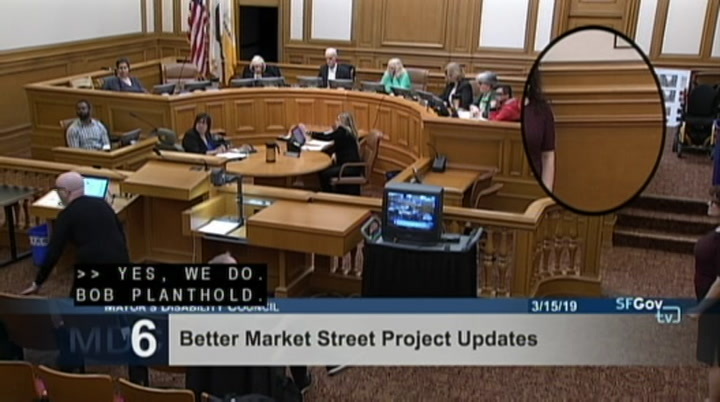 so even with better market street we still have two lanes in each direction. then the existing curb line will be moved out two feet into the roadway to help make space for the new sidewalk-level bikeway. 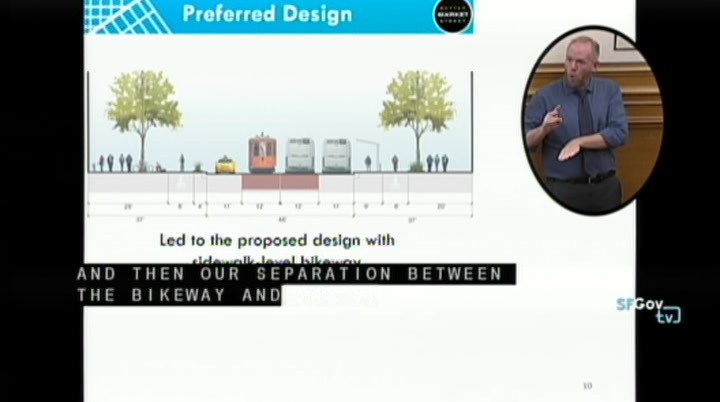 so the standard cross section is to have a 4-foot buffer between the vehicle lane and the bikeway. and then our separation between the bikeway and the sidewalk and the remainder of the sidewalk is for people that are walking. so in most place it's around 25 feet from the property line to the building face. 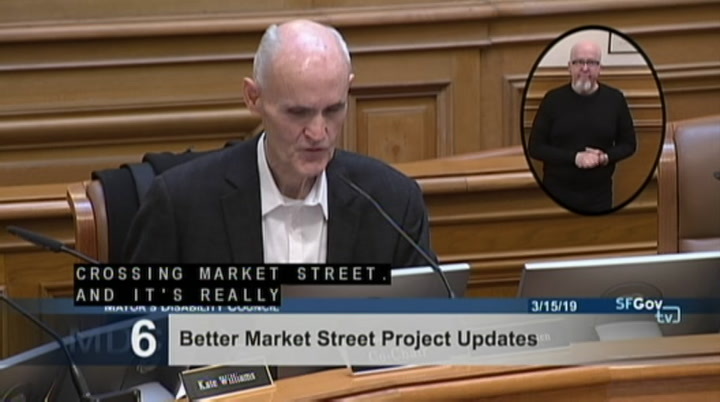 this particular cross section of market street is also showing a curbside boarding island, which is 9 feet wide. you can see that on the right side of the slide. this is a rendering of our proposed project. you can see the two lanes, two vehicle lanes in the roadway. the sidewalk-level bikeway. the separation and then a clear furnishing zone where we are trying to move all of our existing street furniture into one area, including the path of gold, which are both streetlights and muni poles for their contact system. all the street furniture will run there, the trees and other street furniture. then the clear walkway for pedestrians. and then allowing 5-6 feet for table and chairs at restaurants. some of the key considerations is we evaluate different paving materials is the surface roughness, so consistency and slip-resistance. looking at texture and color and the joints. the frequency of the joints, the spacing and the delineation of the pavers. level. 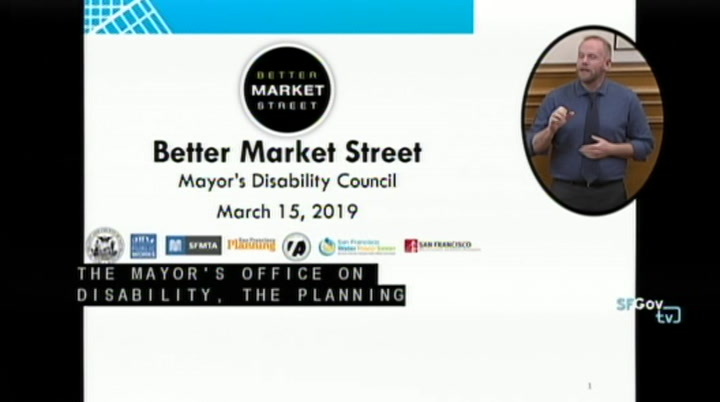 those loading zones will be separated from the sidewalk by truncated domes because it is a vehicle area and we'll continue to use truncated domes there. we'll have ballards to ensure that vehicles stay within the zone. we're making sure it's wide enough so that para transit vehicles can deploy their ramps and help people get on and off the para transit vehicles. loading will be restricted to off-peak hours. so during peak hours when we have a lot of people using our sidewalks, we'll restrict the loading from happening at those times. 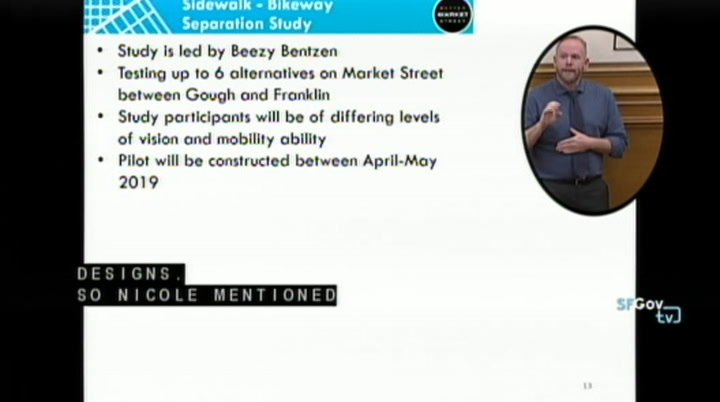 and the bikes will be on the outside of the loading zone. 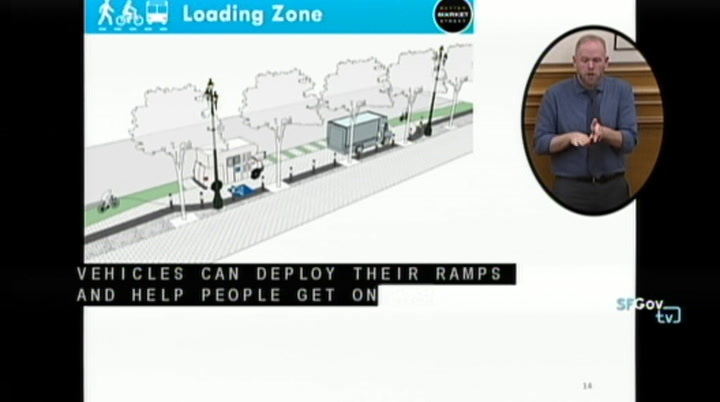 so the vehicles will actually roll up onto the loading zone and bikes will pass them on the left. this is an image of a curbside boarding island. you including deaf people in the groups? i'm thinking about the impact on the deaf community. it's a concern really, about -- and based on my own personal experience of having been hit by vehicles, i'm wondering how you chose the individuals that you focused on and the groups you were discussing these plans with? and just seeing what the results of these focus groups are. i'm wondering if you're going to include lights as warnings, or is that a separate part of the process? that's some of my questions. >> thank you, those are good questions. i took over the project last may. so i'm not sure how people were selected prior to that. 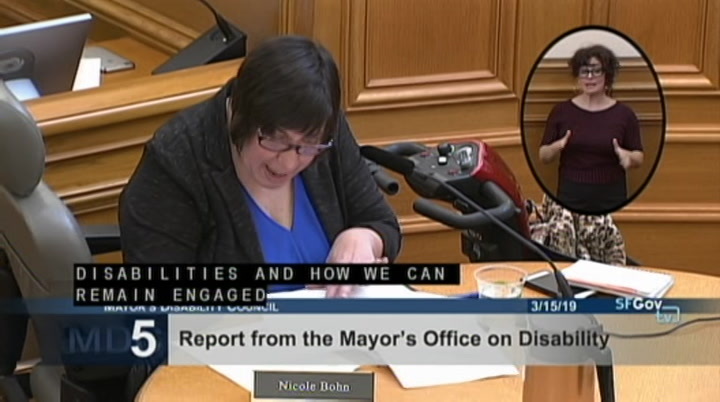 i think we've worked quite a bit with the mayor's office on disability and i think it's a good idea to include people who are deaf. we can definitely do that moving forward. as far as lights, the accessible pedestrian signals do have vibration as well sound. 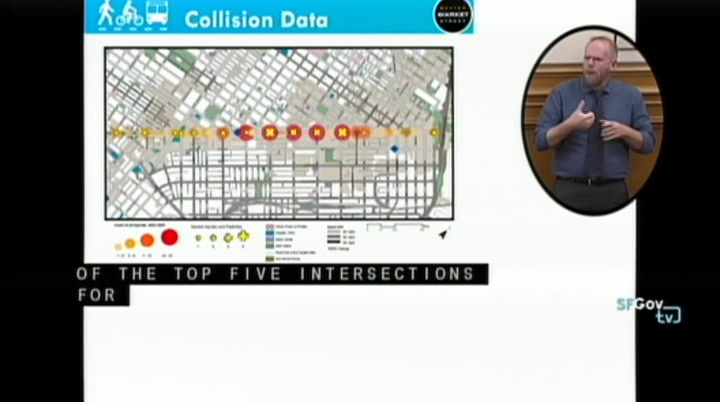 public in the focus groups, but how do we change information about how to be more observant as a driver? and deaf people specifically. i'm thinking about how we raise awareness and how there is a lack of information and understanding out there in general. >> so we often work with the municipal transportation agency to add enforcement and education to our projects. not just the engineering changes. 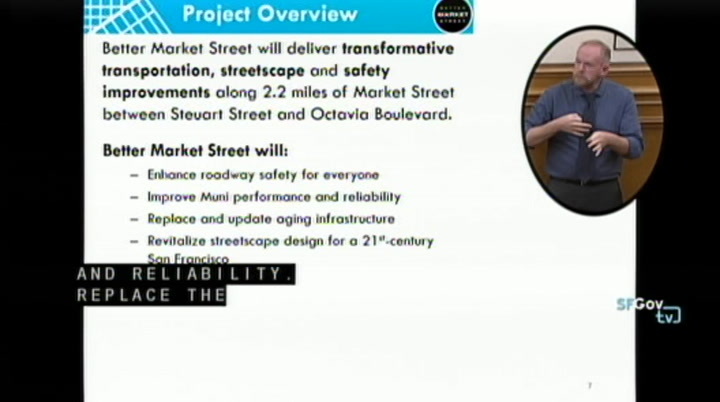 and so that is something we'll continue to do as we implement better market street. 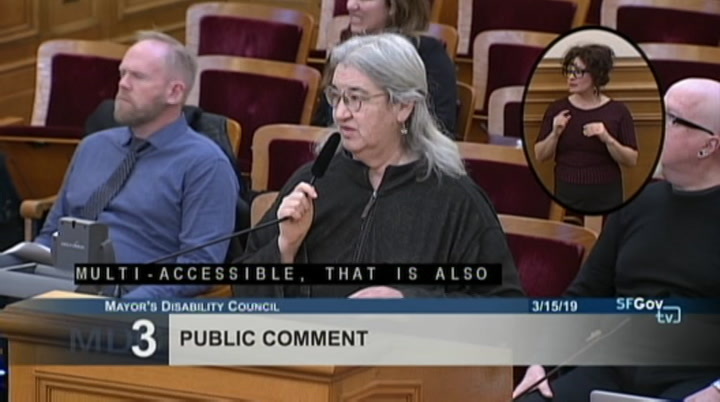 i think working through the mayor's office on disability and the mayor's disability council we can pull in more representation from the deaf community. 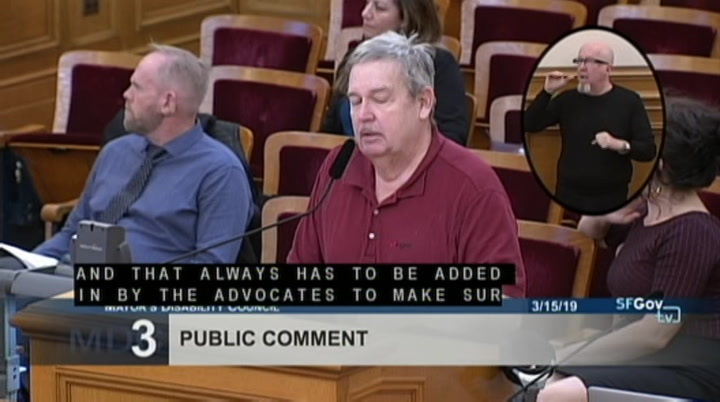 >> co-chair senhaux: that would be great, thank you. 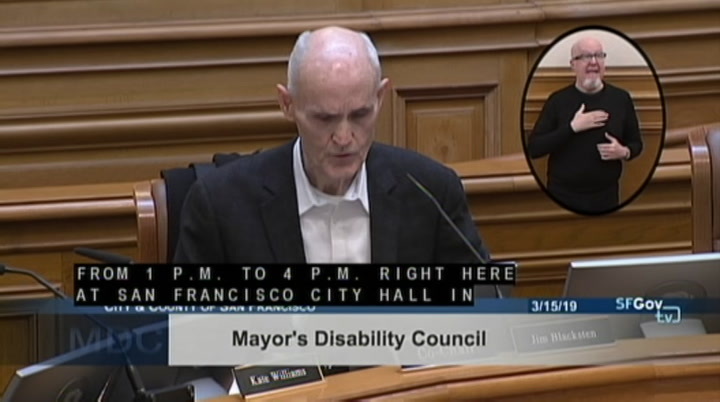 >> council member mcdonald: hi. on disability at the time. and lrc, bob was on that focus group. ilrc facilitated that meeting. 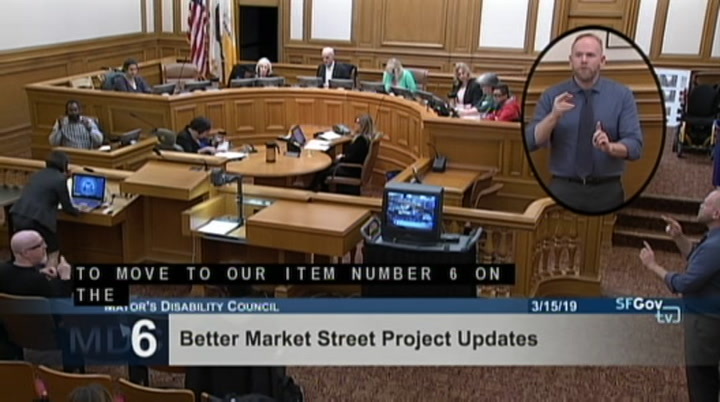 for the separation study, we'll continue to work with the mayor's office on disability and we also hired a consultant team. 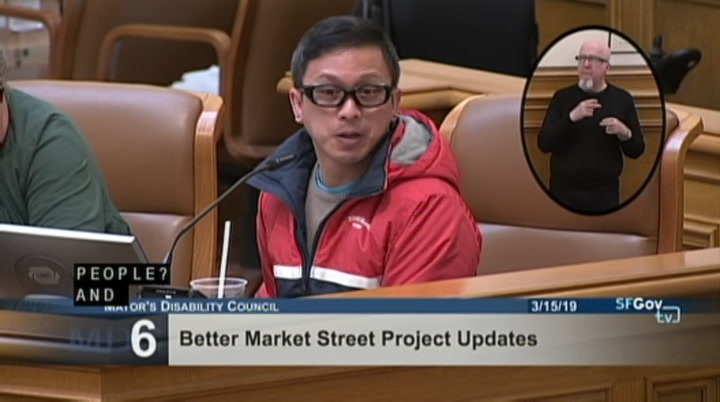 benson is part of the consultant team that includes civic edge that will be helping us reach out through the community to find representation. 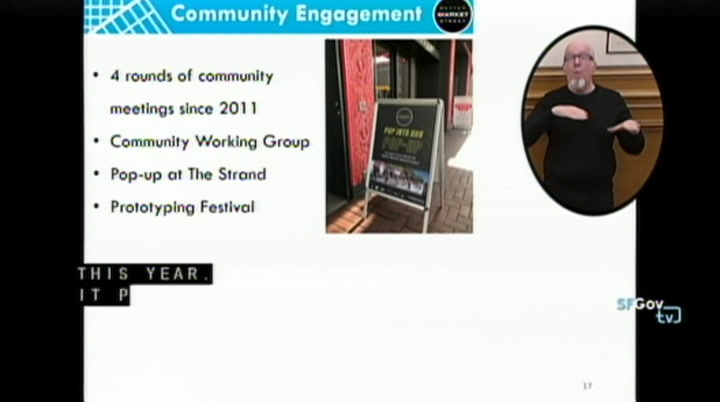 but again, working with mod, working with lighthouse, working with ilrc and the key advocacy groups in the city. >> council member madrid: i'm wondering how maem people in the group? >> for the separation study -- >> i think, alex, are you asking about the community working group? 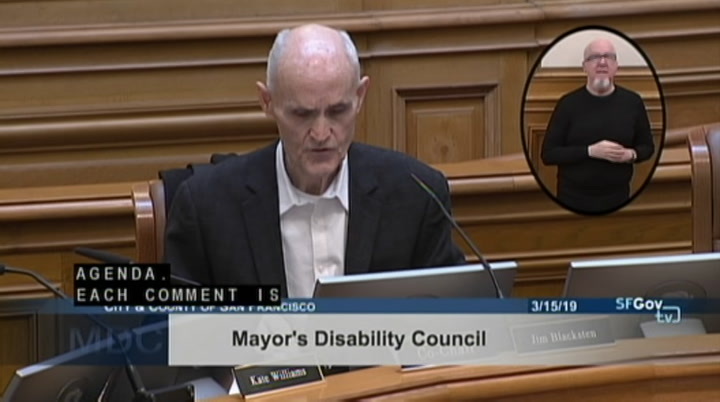 >> council member mcdonald: yeah. up there. 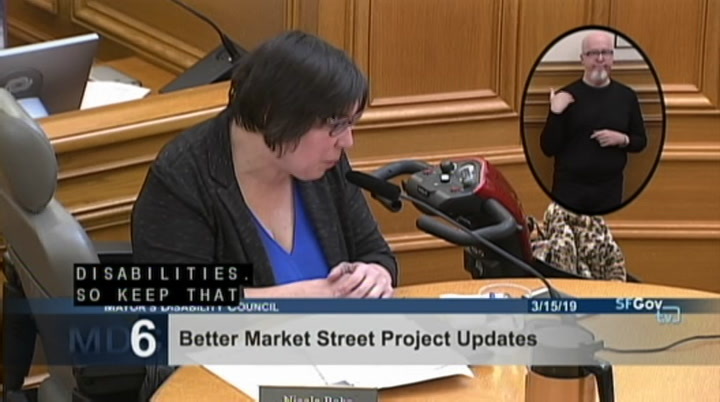 i think, kind of in tandem with what is happening on better market street, much of this pedestrian safety conversation is also happening through vision zero. 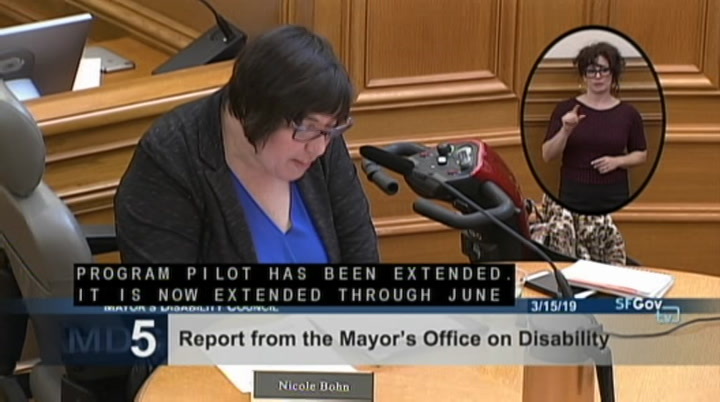 and i know the council has had interest in giving an update from the colleagues that are working on vision zero initiatives for people with disabilities. so keep that in mind, i encourage to ask for update on that because all of this works together. 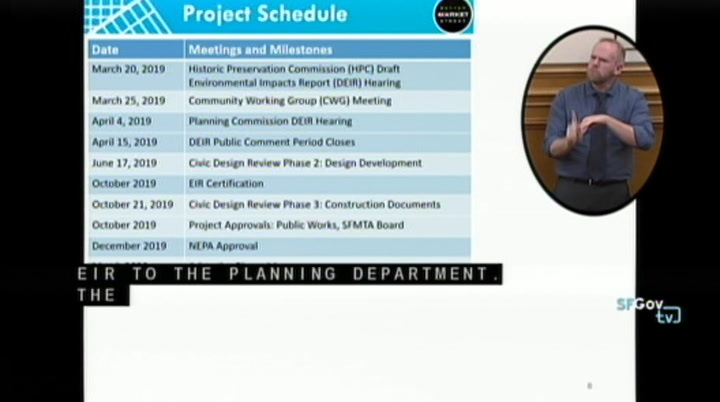 and then to keep in mind that the delineation project, the folks have not been selected for that yet, that's coming later this summer, but there are many opportunities to engage and provide comment in the interim through the various -- to these various public meetings. >> co-chair blacksten: any more comments from staff?